Wow! What a weekend!! 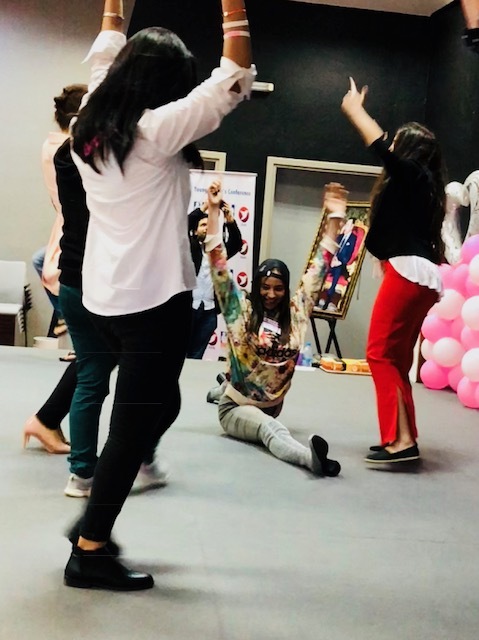 The Young Women’s Conference 2018 was an extra ordinary experience! 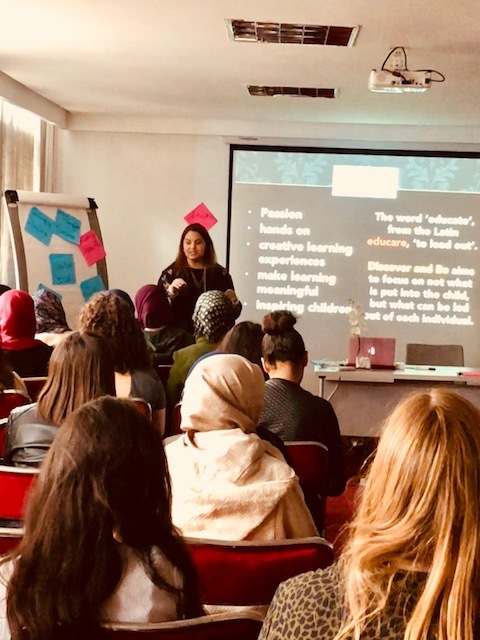 A few short weeks ago I was asked to join the leadership team for ‘The Young Women’s Conference 2018’ in Morocco. 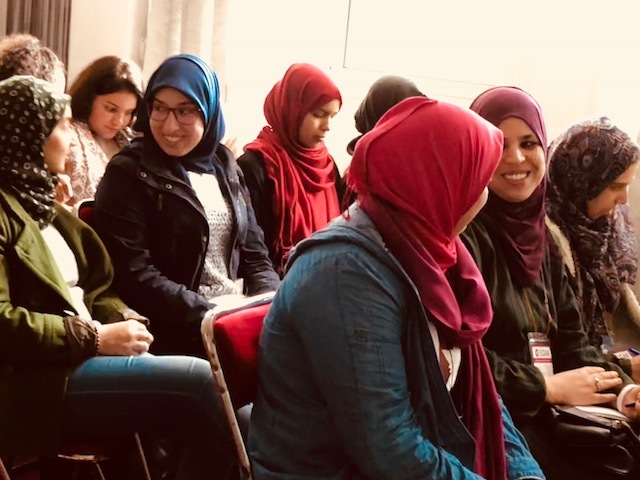 Understanding little more than it was to inspire young Moroccan girls and women to support each other to be the best versions of themselves, I agreed. I was nervous as I didn’t really know what to expect. I knew I needed to deliver a workshop about something I was passionate about. Coming to the disappointing conclusion that an hour workshop on the fabulousness of The Eurovision Song Contest wasn’t quite what was expected, I of course knew that I would talk about education. You would think as a teacher it would be easy to stand up in front of people and talk, but this was sooooo way out of my comfort zone. Sam, the only other UK member of the leadership team (everyone else was American), and I arrived in Casablanca, met a couple of the other leaders, got some instructions for the next day and went to bed. We were up at the crack of dawn to pile into a minibus with seven (almost) strangers. We were taken to a university in order to invite the ladies to the conference, taking place the next day. The American team members had done a couple of these talks already so were able to give a very brief description of what to expect. All we had to do was stand up, introduce ourselves, say why we were there and sit back down. The main talking and inviting would be done by someone that had already seen how it was done. Ok, I thought that’s not so bad for day one. I had about half an hour to get to know the rest of the team before we arrived at the university. Little did I know that this collection of women would turn out to be some of the most incredible, amazingly supportive and loving women I have ever met in my life! We were shown into the Principal’s office and offered tea! Not like any Head's office I had ever been in before. It was a bare prefab with a long table in it, with papers in Arabic all over the desk. There was absolutely nothing on the walls and even more strangely.... NO COMPUTER! They didn’t speak English and we didn’t speak French or Arabic. 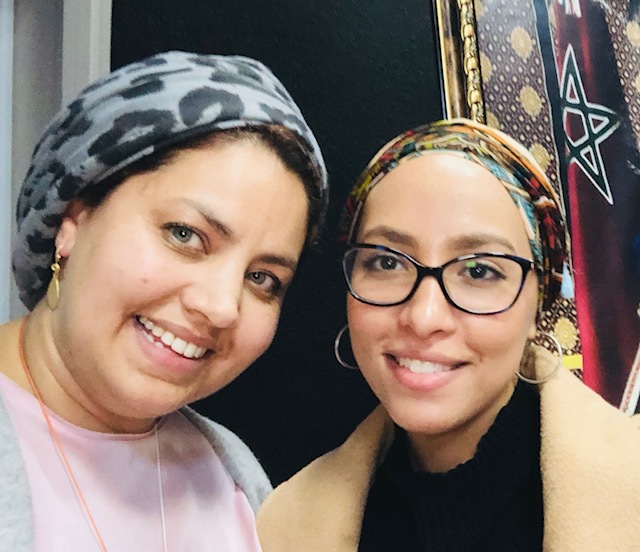 Thankfully we had a wonderful translator in the form of Yasmine, a remarkable and talented young Moroccan women, who was the main person on the ground throughout the whole conference. There was then a great deal of glancing at me specifically and I started to feel a little nervous. It turns out we were about to address a room full of trainee teachers! Oh no: I know where this going! Yep, you guessed it. Not only was I going to have to ‘do the talk’ I was going to have to go first! (Oh s**t). I had about four mins to plan what I was going to say having never seen anyone else do it before. We walked into a lecture theatre and onto a stage. Faced with about 40 eager faces the leadership team began introducing themselves. And then it was my turn. With my very quick four minute plan in my head, I stood up and... said something completely different! Phenomenal. The adrenaline got me going and out came... a sort of PSHCE lesson I’ve done several times about changing the world by having a positive impact on the people around you. Yikes! I have to say they were a gracious audience and lapped up everything I said. I sat down thinking ‘I really hope that was sort of ok and what I was meant to say’ when Sharon, a wonderful member of the leadership team who I had met only half an hour before, put her arm round me, hugged me and said, in a wonderful American accent ‘That was awesome.’ Sharon: if you read this I truly want to thank you for that moment. I was so nervous and you genuinely made me feel so accepted with that gesture; it was slightly breath taking. And that is how the weekend continued. And so the big day of the workshops arrived! I was still terrified. I had no idea how big my audience would be; how many would be interested in education; if what I had to say would even be relevant in Morocco and if language barriers would prevent us being able to understand each other. With all this in mind, when planning my talk, I had decided that the answer was straightforward... don’t talk about education, talk about teaching. And that’s when it came to me: ‘We Are All Teachers’. So with that in mind I began my workshop by asking them who their favourite lawyer was! Yep, they were as confused as you are right now! No one had an answer. Then I asked them who their favourite teacher was. Guess what? Everyone had an answer to that question. The reason being, EVERYONE IS AFFECTED BY EDUCATION, therefore EVERYONE HAS AN OPINION ABOUT EDUCATION. And so the discussion began. 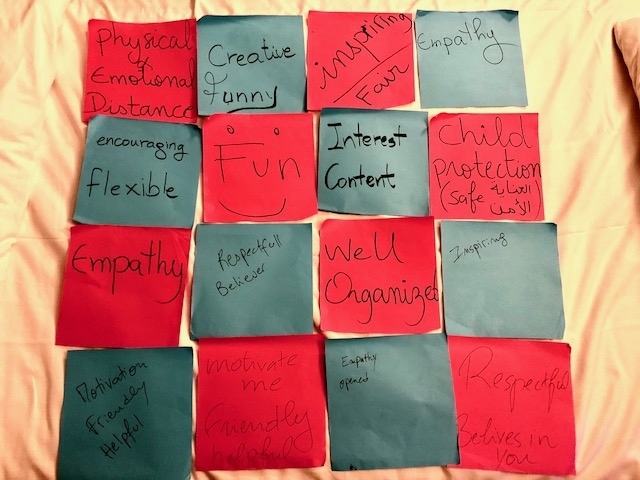 I asked them to share with each other the good qualities of teachers that impacted their lives, and name the bad qualities of other teachers that perhaps impacted negatively. We threw it all out there in the open. It was wonderful to see some of the ladies from the teacher training college in my workshops. They wanted to ask me EVERYTHING about becoming the best teacher. But, as I told them, the reality of it is, they didn’t need to become anything as ’we are all teachers’ already. We all teach others everyday whether or not we are teachers by profession. We teach our children, we teach our parents, we teach our peers, work colleagues even strangers. Whatever we do impacts on others and they learn from the experience. In turn we learn from them too. Meaning that, yes, we are all LEARNERS too. This conference was all about empowering women and it did just that. The young women we met, were kind, caring, brave, grateful and honest. The main age bracket was about 11-22 years old. But regardless of age they were all hungry to hear what anyone in the leadership team had to say. Apart from our individual workshops we worked more closely with the women through various activities over the two full days of the conference. On the second day we came together in small groups. We took part in team building games, how to deal with conflict sessions, dancing activities and even a bit of singing. Each of the leadership team led a group. Each lady had a postcard. Throughout the conference we got to know our ladies and we were able to write messages of support and encouragement on the cards for them to take home. It was AMAZING to observe them in all these scenarios. They showed dedication, vulnerability and a passion to strive for more in their lives. On each card I wrote down what I had observed about them throughout the conference: their strengths, their vulnerabilities, the beauty they showed when they supported one another. I was blown away by these ladies. Truly, they had so much to give and no idea how special they were. Girls brought by their male teacher! A few days later I got a notification on Facebook, one of my ladies had changed her profile picture to a photo of the words I had written about her when we worked together. Wow! 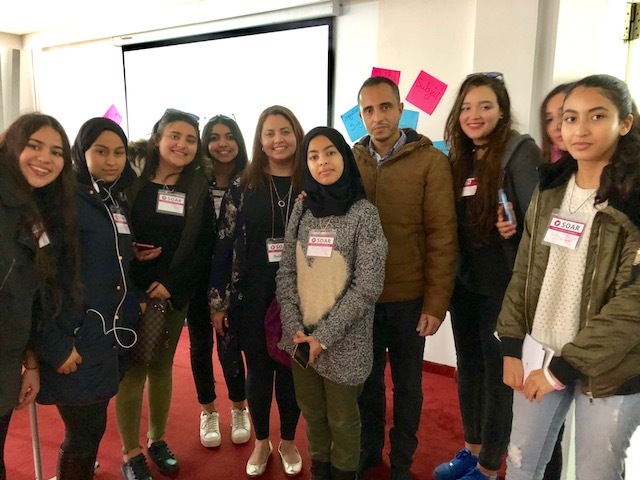 I went to Morocco to support and empower the young women, never expecting to feel the same in return. Our philosophy at Discover and Be is all about how to educate creatively in order to empower and inspire our pupils. The word ‘educate’ comes from the Latin ‘Educare’ meaning 'to lead out'. What was amazing about the conference was not what I hoped to teach them, but what they led out of me. You see, this time I wasn’t the only teacher in the room, they taught me that I could do this because, like I said at the start, ‘We Are All Teachers’.